Thanks to all that came on our annual farm walk last Sunday, we had beautiful October weather and a great bunch of people joining us, including lots of enthusiastic children and a few dogs. 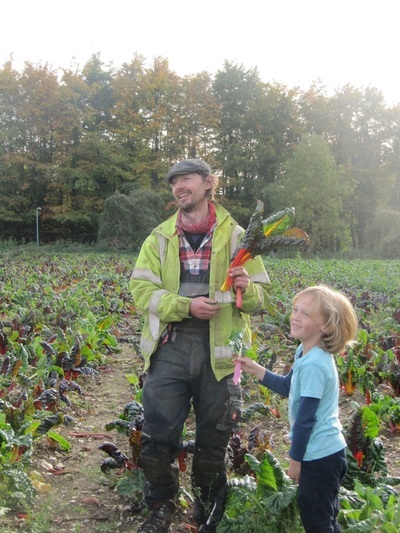 Martin took everyone through the forests of kale, past our spinach and chard patches, then onto 'Prescott' field, where we are growing most of our cabbages, sprouts and broccoli this year. Then down to the bottom of the filed, where there were still a few pumpkins not yet picked up, so the children were able to select themselves a pumpkin. Add to that the apple-bobbing and a taste of Sarah's beetroot and chocolate cake (recipe coming soon!) ,an enjoyable afternoon for all.Its always good to meet new, old customers and potential customers, thanks to Jackie for the photos.